My mail order from God baby, Mozart. This is a stranger than fiction story! I had researched and found the wonderful Coton. However, I had made a promise that my next dog would be a pound puppy. But I REALLY wanted a Coton! So I looked nation wide for a rescue. None. So I decided...let it go....a pound puppy this time due to my self promise. I literally two miles down the road, walked through a kill shelter and there was Mozart. Until I ran into a Coton owner was I certain he was a Coton. He was only a year old. He is so silly and sweet I decided to name him Mozart! The pound neutered him. He was not microchipped either. I decided to look for his first owner, because his coat was in really good condition. But after a month I saw nothing. We love him so much. He is adorable, funny, sweet and beautiful. So I have no explanation other that he is gift from God. Comments for My mail order from God baby, Mozart. What a fabulous story and I'm so happy you shared it with us.. You & Mozart are very fortunate to have found each other.. Here's to many years of love, laughter & pleasure! I am so in love with my little Mozart " Mo Mo" ! This breed is so special! I still can't believe how blessed we were to be adopted by this silly little man. He is sweet. He wakes me up as soon as the sun comes up and just loves to go for a walk with his favorite toy of the day in his mouth! I am going to post more photos soon, hopefully right side up! I know mine was a gift from God since my story is similar where I never could of afforded a high price tag. I lucked out w/$500 at 6 months all shots including 6 mo rabies. I am so happy for u they r the best present/miracle ever. I think how lucky I am every morning when I hear the feet coming to find me w/a smile on his face. Bless you and much love and happiness with Motzart, he's beautiful. What a handsome little boy!!!!! I think my Triscuit is in love again...Good luck with him it sounds like it was certainly meant to be.....you will have lots of fun and endless laughs with him around. Don't worry about the upside down pic, I do it all the time but we got the pic and that's all that matters. Love and Licks from Triscuit . It amazes me that these little treasures ever end up in a shelter. He is just beautiful and I am so very happy for you both. Enjoy him and love your story. They are just sooooo special. Yes, even upside down he definitely looks like a Coton. So glad you found him! Sounds like the perfect match. You are very lucky to find such a wonderful dog in a shelter. 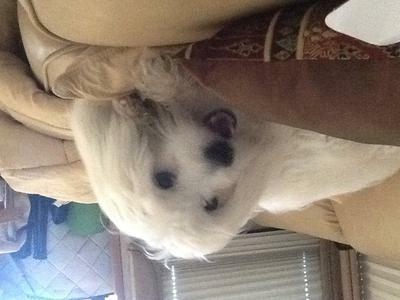 Although, your picture presented upside down, Mozart looks like a Coton.